I’m sure you saw all my winter wonderland photos on my insatgram and snapchat from our Thanksgiving weekend spent in Deer Valley… All of the fresh snow was so magical but it was super cold, colder than I expected. One day it was literally 7 degrees! Growing up in Utah you’d think I would get used to the bitter cold winters, but every year when winter rolls around it’s like I forget how cold it really gets. I remember when I was younger my parents would bundle us up in our big, puffy snowsuits and coats that were embarrassing and so not flattering (please tell me I’m not the only one who had a marshmallow coat? ;) Nowadays there are so many options for coats that keep you warm but are also super cute (my sisters and I like to call it mountain chic)! 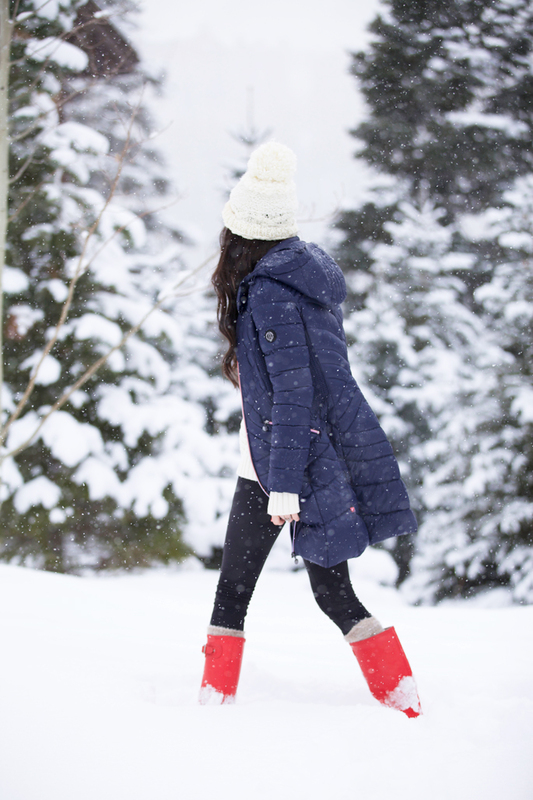 This Bernardo coat did the trick while we were enjoying the Winter Wonderland this past weekend. I love how chic, warm and comfortable it is. It’s a coat that I think I’ll be wearing quite a bit this freezing holiday season!! Brought to you by Bernardo. Such a winter wonderland! You look amazing! I love how you mix and match the red hunters and the blue Bernardo coat. It looks amazing with all the snow. Love the jacket! The snow falling down makes these pictures so beautiful. The scenery is beautiful and I love the long jacket look! Leggings, hats and cozy sweaters have been my winter uniform lately. Love how cozy you look. It can get really cold and snowy where I come from in Europe, Helsinki! We do have a Winter wonderland each year and I love it, just that here it has tendency to last for “too long” and all I wish for then is to fast forward to Summer. Oh my look at all that snow!!! It does look pretty though. Staying warm is key in the Winter and it is rare to find one that is cute and functional!! Love your coat! These pictures are so stunning! Wish we had some snow in London! *Sighs* I wish we had snow in Florida. Oh nooo you don’t lol! I’m from Canada and we have brutal winter weather conditions where it makes driving so dangerous! Plus it adds so much time to an already awful commute home from work!! Blah! Lol! Enjoy the sunshine! I absolutely adore this coat. And yes, I was a victim of the marshmallow coat when I was younger too (I’m glad those days are over haha)!! I like your hat! I have a Moncler coat that is really nice! This is a perfect wintery look! Beautiful photos! Sure does look like a winter wonderland…such great pics! Love these photos! You look pretty as always! Ahahaha definitely not the only one. That happened to me too. Loving your boots and lips. I’m sure it’s freezing, but it looks fabulous. These photos look like perfection. Just wow! I’m so jealous of your snowfall! Looks absolutey beautiful! That’s a nice looking coat for the winter months. I always hated those bulky styles from my childhood, but this is one coat I would actually want to wear. So I’m not the only one who calls it a marshmallow coat haha. Yours looks very chic…or course. :) 7 degrees yikes! But it does make for beautiful snow and very beautiful photos! I love how this coat is still flattering while adding a warm layer. It can be hard to find winter coats that keep you warm without the dreaded marshmellow look. 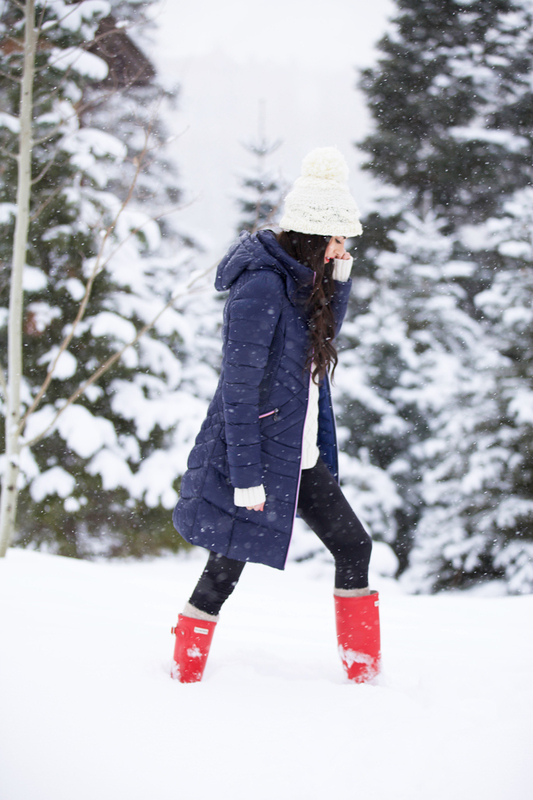 Hunter boots are great for high snow fall to keep your feet dry but aren’t neccessarily that warm. It doesn’t look like you have the Hunter boot liners in in these photos, do you find your feet still stay warm with only thick socks? Love love love how warm that jacket looks! This outfit is so cute and cozy! I love those red hunter boots. Very cute look, all that snow wow! Wow, look at all that snow! Wish I was there! Such cute photos! Perfect timing, I’m looking for a new snow jacket. I love this one. Can’t wait to hit the slopes! Beautiful, as always! Adore the red lipstick, white sweater and dark hair combo… so classy! Perfect coat for that weather! Perfect look for snowy day. I grew up in Russia and never got used to cold weather either. I totally agree, I forget every winter how cold it can get! I’m talking on the blog today about how to protect your skin in the winter, especially during pregnancy, if you’re interested! I love that coat! And the boots! But the most amazing is the scenery! It really is winter wonderland! I love these pictures! You look so cute and festive! It is so magical to see all of your wintery adventures! You are the cutest in your puffy coat! That coat is so perfect! I’m going to Wyoming for the holidays so it’s a lot colder than I’m used to here in Vegas. I’m on the hunt for a winter coat. Loving the red lips and boots! love they navy, red, and cream color combo! super cute! Love your photos, great Hunter boots and hat! The snow is so beautiful. I love your blue coat. but $188.00 is a bit expensive to me. Thank you for your beautiful pics. All that snow looks amazing!! 7 degrees?!? How did you survive!? I totally remember my mom making me get all bundled up and I hated feeling so ugly! It’s nice to be able to find cute ways now to stay warm. I need those boots are on my Xmas list! These pictures are amazing! I’ve never lived in the cold (Peru & SoCal all my life) and don’t think I would get used to 7 degree weather… but do LOVE going to places with snow to visit! What color are your boots in? I couldn’t tell on the Nordstrom website if they were lava red or mltred. I am always on the lookout for a warm coat- this one looks very snug! You look so cute, great post! love the coat. Looks so confy and warm! Stunning lighting. Love everything about this.